For Elizabeth and Chace Hill, their local, family-owned winery is a place where family and friends treasure time together and share a bottle of wine. 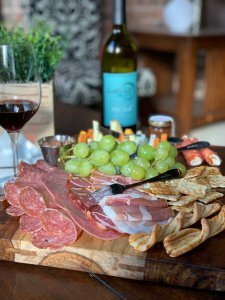 Naturally, food brings people together just as wine does, so the Hills set out to add some savory dishes to their menu at Trilogy Cellars. Grape Grower and West Texas native, Chace Hill, took his creative expertise from the vineyard to the kitchen. After collaborating with his sister, Kaili, a former student of Le Cordon Bleu in Paris, Chace set out to pair two of comfort’s favorite friends: wine and pizza. 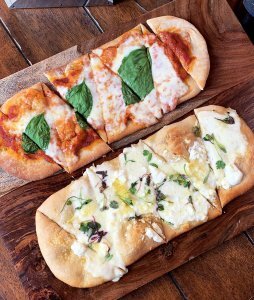 The list of flatbreads served at Trilogy Cellars includes signatures like Margherita dressed in marinara, mozzarella, basil, oregano and olive oil. This dish is suggested with a glass of Montepulciano or Malbec. 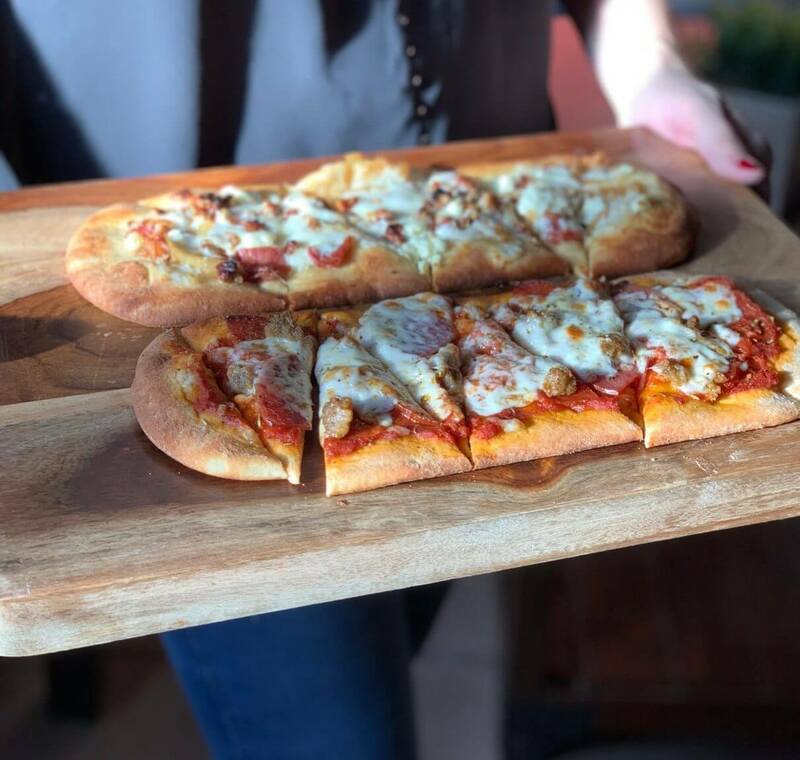 Another option is the Italian flatbread finished with marinara, mozzarella, pepperoni, Italian sausage, basil and balsamic drizzle paired with the GSM or Merlot. For those interested in impressing the palate, try the Blanco which is topped with olive oil, mozzarella, goat cheese, Parmesan, truffle oil and microgreens. Elizabeth recommends pairing this flatbread with the Banna Sue or Intersection. 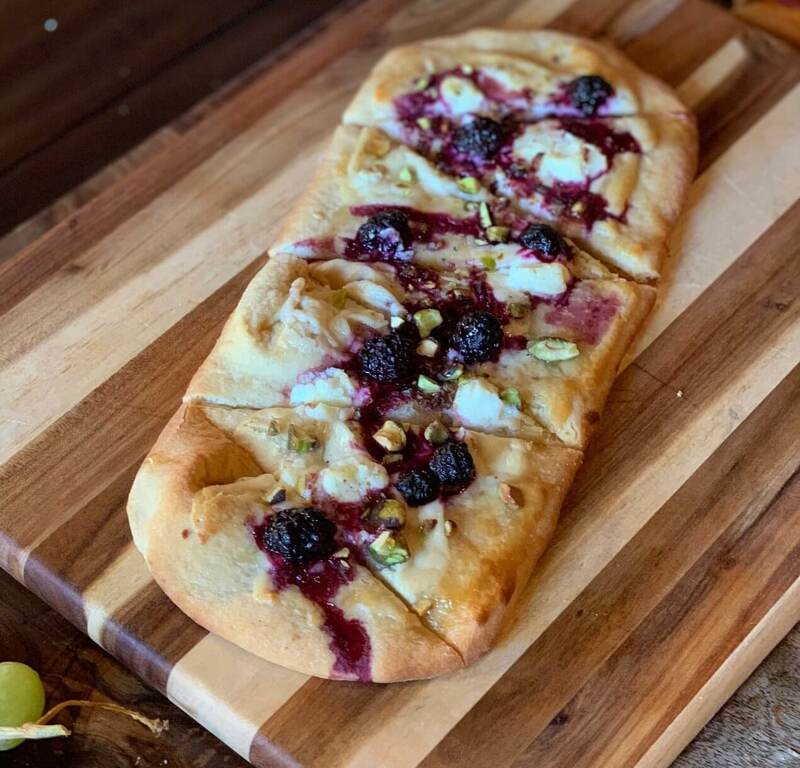 Meat lovers have met their match with the Burklee flatbread stacked with olive oil, mozzarella, Feta, bacon, Prosciutto, caramelized onions, and glazed pecans. Try a slice with the Courtney or Tempranillo. If you’re craving something other than pizza, order the charcuterie board, Bruschetta Bites, or the Spinach Artichoke Dip. Not to worry, the winery boasts plenty of award-winning bottles to accompany an appetizer. Looking for a sweet option? Try the Viv flatbread with a goat cheese spread and berries topped with Pistachios and honey and matched with a Moscato or Gewurztraminer. Guests can savor these dishes at Trilogy Cellars for lunch or dinner. Anytime the winery is open, the food is available to order. Lucky for us, Burklee Hill Vineyards will bring this delectable menu to its tasting room in downtown Lubbock which opens in early 2019.